Improve the look of the your satellite TV Dish and "send your own signal" by displaying the logo of your favorite team. "Dish Rags" patent pending dish covers provide a "one-size-fits-all", easy to install fabric cover that does not affect the TV signal. Whether your dish is used when tailgating or camping, or mounted at your home, apartment or condo, or is mounted on the lake house or hunting camp - IT'S TIME TO SEND YOUR OWN SIGNAL! Made in the USA and designed to fit standard size 18" to 20" DTV and Dish Net dishes. An additional fee of $5.00 will apply for delivery to Hawaii, Alaska, Puerto Rico and Canada. We will be unable to accommodate deliveries to any other international destinations. NFL New York Jets Satellite Dish Cover (more info) — only 5 left! NFL Baltimore Ravens Satellite Dish Cover (more info) — only 6 left! 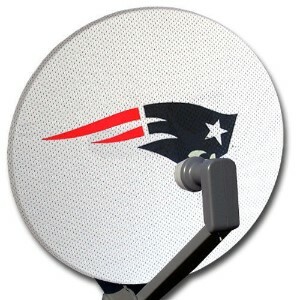 NFL New England Patriots Satellite Dish Cover (more info) — SOLD OUT! 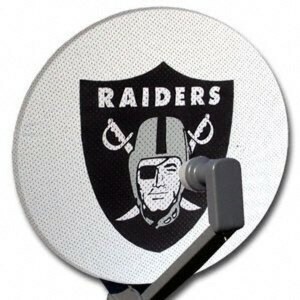 NFL Oakland Raiders Satellite Dish Cover (more info) — only 5 left! 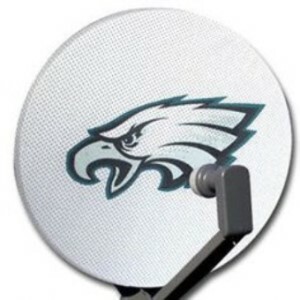 NFL Philadelphia Eagles Satellite Dish Cover (more info) — only 3 left! 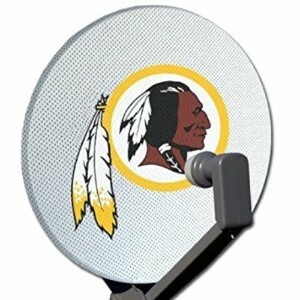 NFL Washington Redskins Satellite Dish Cover (more info) — only 6 left! Shipping & Handling: Free shipping within the contiguous United States. If shipping to Alaska, Hawaii, Puerto Rico, or Canada $5 additional.